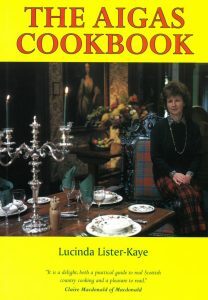 Cordon Bleu trained Lucy Lister-Kaye runs the catering at Aigas. The estate is organic; we eat much of our own produce – beef and venison – and we buy ingredients locally whenever we can. Dinner is a 3-course set menu, breakfast is hot porridge and a help-yourself buffet of lots of cereals, toast and fruit. Every day fresh rolls and baguettes are made up for your packed lunch and guests are offered a selection of many other ingredients to take with them each day. Thermos tea and coffee are carried on all expeditions. Special dietary needs are not a problem at Aigas. We prepare special meals all the time. Just let us know your needs on booking. The Aigas Cookbook of favourite dishes is available to purchase in the Aigas shop, or can be arranged by phone or email.